Gather ‘round, boys and girls, for the harrowing saga of my first long-range winter trip in Minnkota’s Chevy Bolt. The temperatures were dangerously low, the winds were killer and the hills were unexpected. 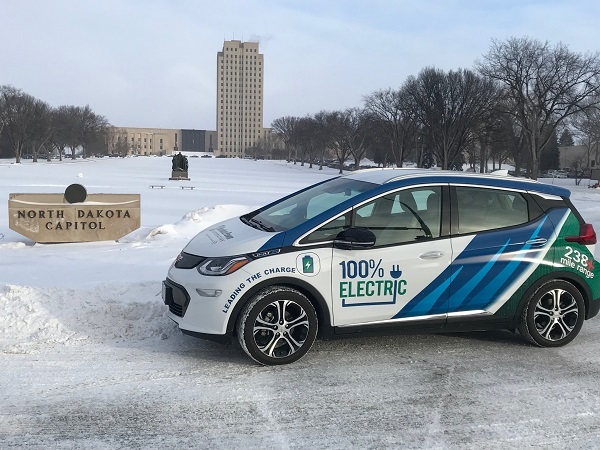 Can an electric vehicle make it from Grand Forks to Bismarck, N.D., without needing a tow somewhere around the route, when the conditions are on the opposite end of the efficiency spectrum? 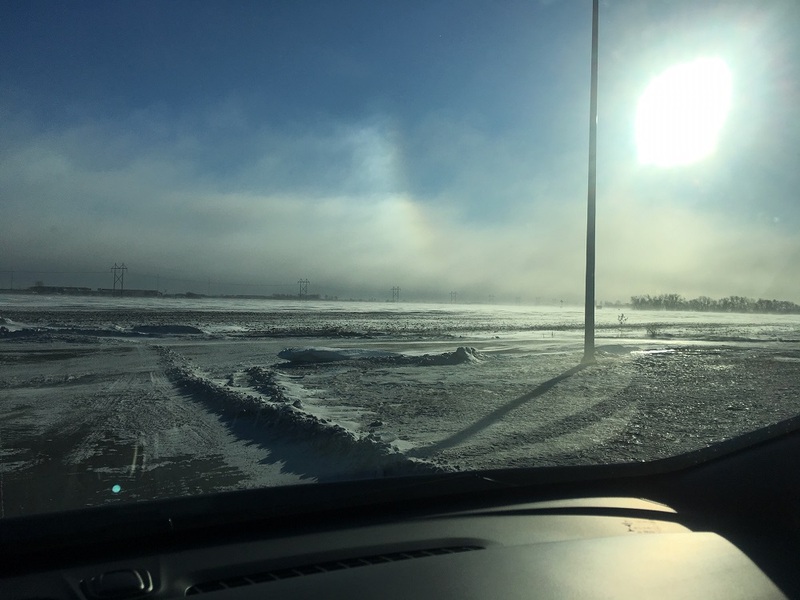 You can tell by the slight formation of a sun dog on the horizon that it was incredibly cold when I left Minnkota Thursday morning. Don't worry, I parked to take this photo. I left Minnkota around 10 a.m., three hours later than I had planned (in order to allow the winter weather to fully move out of my driving route). I left with 131 miles of anticipated range with the cabin heat running at 68 degrees – that was an area I couldn’t skimp on, as the air temp was 11 below zero with a wind chill that was much lower. 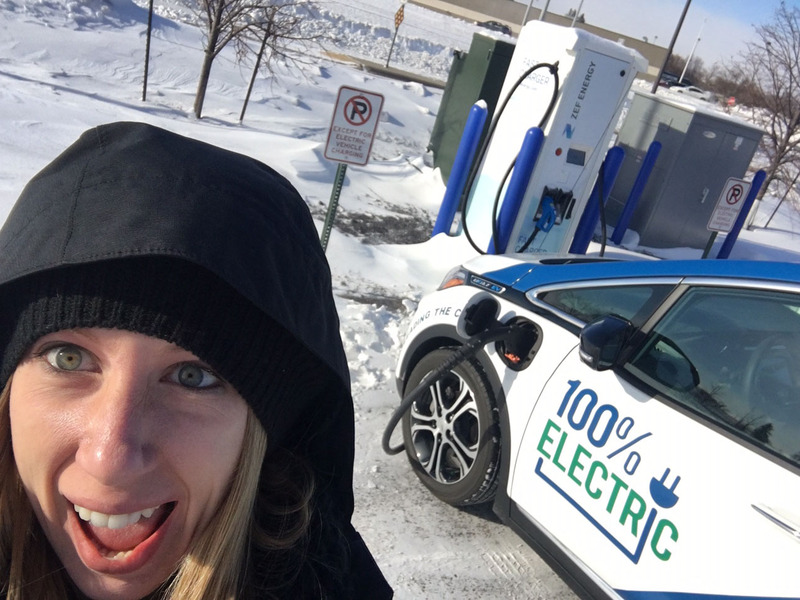 I headed south on the interstate for my first checkpoint, the DC fast charger in Moorhead, where I would stop for a full charge. I took it at a slow 65 mph to get my best efficiency, but quickly found that the strong north wind was pushing me along, with my efficiency gauge topping out on the green side. This trip was going to be a piece of cake! My energy score from Grand Forks to Moorhead says a lot about eastern North Dakota – super cold and super flat. I plugged into the ZEF Energy fast charger (no other users and no payment necessary! ), which told me my 30 kWh charge would take about an hour. I chose one of the several eateries within 100 feet of the station (I’m looking at you, Noodles and Company) to grab some lunch and catch up on emails. A quick pop over to Starbucks for a coffee and I was once again road ready. But the car wasn’t quite on the same page. I plugged in with no problems in Moorhead and was feeling really optimistic after the first leg of the drive. I took this fast charge photo right before my fingers went numb. The Bolt had charged to almost 80 percent before the charger shut off, citing an "isolation fault." Upon further research, I found that this sometimes happens when the cable shifts and causes a disturbance on the plug. Another thing to note about some charging stations like this one is that they may stop charging at 80 percent to avoid quickly overfilling the battery. I reengaged the plug, and it continued to charge with a message on my dashboard: Battery will fully charge. Stop charging at any time. I pushed my charge up to 131 miles to cover the 96-mile leg to Jamestown, N.D. This is where the trip gets interesting. If you don’t live in North Dakota, you may not know that the wind here is no joke. And when you’re driving into that wind, it will zap the power out of your electric vehicle. A lot of power. Combine that with interstate speeds (even 15 mph below the speed limit) and climate control, and you’ll be holding 30 kW without a problem (Note: I was holding steady around 20 kW on the drive to Moorhead with similar speed and air temperature). By the time I arrived in Jamestown, I only had 25 miles of range left. In my initial trip itinerary, I planned to plug in at the RM Stoudt Ford Lincoln Level 2 charger (free and available 24/7) for about five hours, walk over to the nearby Buffalo Mall to catch a movie and then over to Perkins for some work, some grub, and, because it’s Perkins, some delicious pie. But my EV math was off in a number of ways. There are two free Level 2 chargers at RM Stoudt's service center with easy parking and a mall and several restaurants and hotels within walking distance. When it's below zero, "walking distance" is debatable. First, my battery had drained more than expected due to the wind. 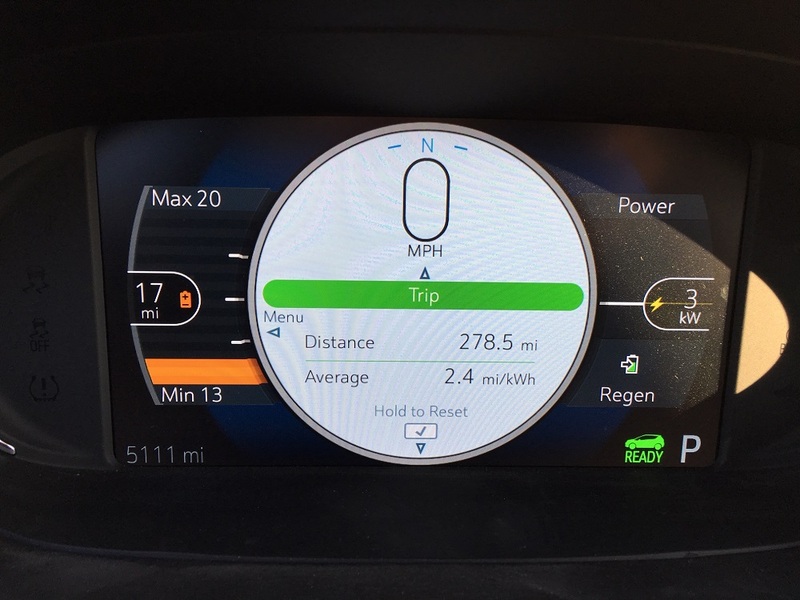 Secondly, I thought five hours on a Level 2 charger would give me about 100 miles of range, but it would not. When one’s overall 60-kWh battery range drops from summer’s 230 anticipated miles to winter’s 130 anticipated miles, the time it takes to regain 20 miles of range is dramatically longer. This is obvious to me now. Long story short, it would take nearly nine hours of charging to get me the battery power needed to get 100 miles to Bismarck with wiggle room. I would have to leave Jamestown at 12:30 a.m., rolling into my Bismarck hotel after 2 a.m.
With wind chills dropping by the hour, I thought this might be an unsafe plan. I cancelled my room reservation in Bismarck and checked into the hotel next door to RM Stoudt, where the helpful desk clerk asked me about my experience with the EV – “It’s uncharted territory," he said, "and it’s going to take a long time to catch on, but the world is going that way” – and recommended the best local pizza to have delivered. I mean, when in Rome, right? 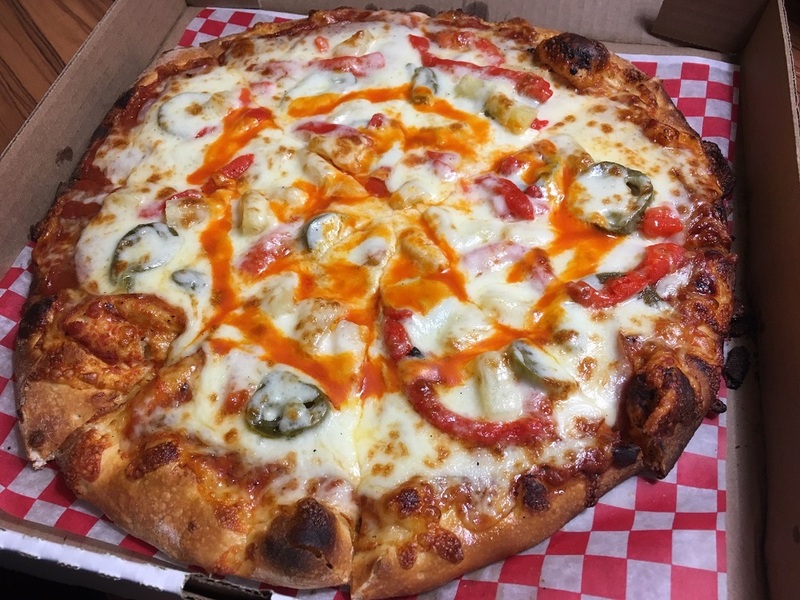 Shout out to the folks at Jonny B’s Brickhouse for the lovely Fiery Hawaiian ‘za! The spice was just what I needed to battle the chill. When I retrieved the Bolt early Friday morning, the battery was fully charged with 138 miles of range. 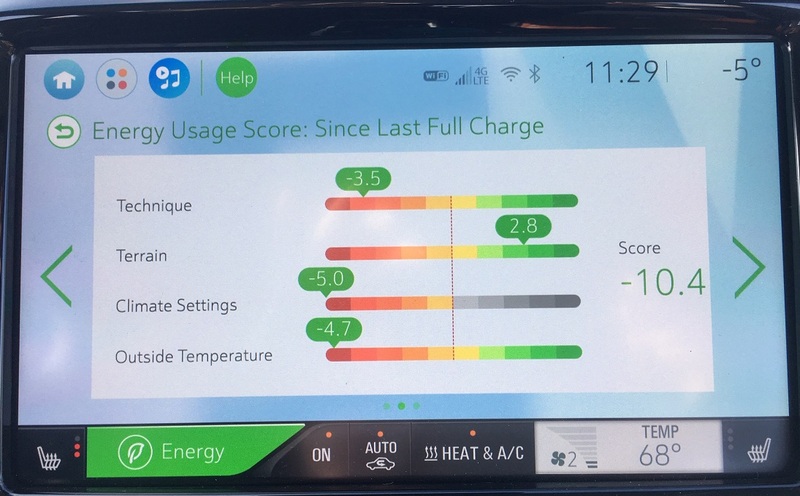 Even though the car had been out in the cold all night, the seat and steering wheel warmers were hot immediately, and the cabin heat wasn’t too far behind – a welcome perk of EVs. The wind wasn’t as much of a challenge today, but still a drainer for the first 30 miles or so. The real kicker this time was terrain. As you get further west in North Dakota, hills become more a part of the rolling landscape. They also became more of a thorn in my side, keeping me at 30 kW for quite a stretch. I kept it slow at an efficient 60 mph (drivers passing me like I was static) but didn’t compromise on heat. Just as I came over the final hill to view the beautiful city of Bismarck – one of North Dakota’s best urban reveals – I got a notification on my dash that kind of ruined the moment for me. Yes, Bolty. That’s the plan. I arrived at the Best Western Roosevelt Place with a blazing orange warning gauge informing me I had only 17 miles of range remaining. My energy panel also told me that the car had used battery conditioning for the first time ever, which used 1-2 percent of my power. Battery conditioning is the Bolt’s thermal management system that heats or cools the battery to keep it at its safest and most efficient temperature. It’s also an indicator that it is darn hot or darn cold outside. I slid into home base just in the nick of time (excuse the double cliché). By the end of the 278-mile trek, I had averaged 2.4 mi/kWh. Not wonderful. Although I had to cancel my Best Western room reservation, employees Steve and Cody treated me like a queen and turned on the Level 2 charger power for me anyway, noting that they are still trying to determine usage rules for the station – guests only, payment system, free for everyone, etc. 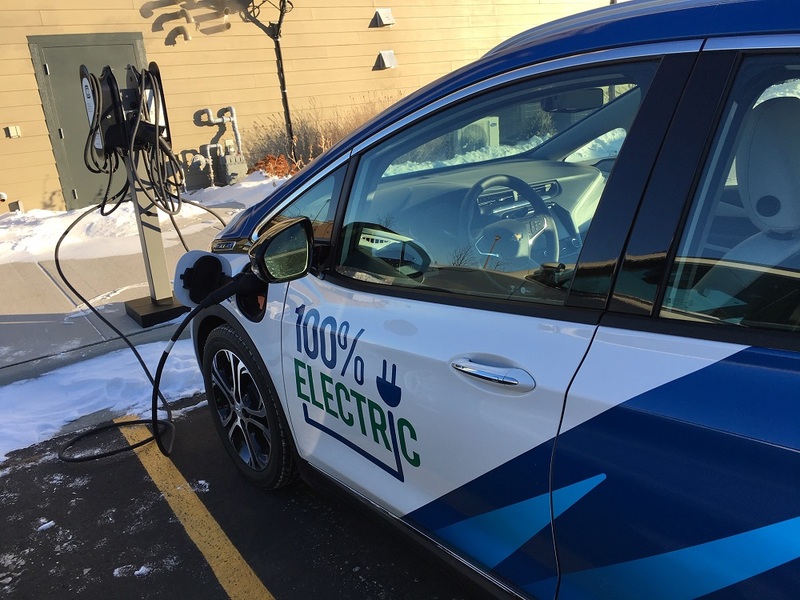 The charger was necessary as a part of their new affiliation with Best Western (which also has a Level 2 charger at its Grand Forks location), and they say it gets used only once or twice a month. I told them that would, hopefully, pick up very soon. It was an easy Clipper Creek-brand plug in at the Best Western Roosevelt Place in Bismarck. If you ask the front desk nicely, they'll turn on the power for you, and there's a Dunn Bros. coffee shop and a couple of restaurants nearby to kill some time. Tell them Kaylee sent ya! As I sipped my hotel coffee (thanks, Steve and Cody!) and waited to hand the Bolt’s keys over to the Minnkota representative who would take care of it during the Energy Generation Conference (thanks, Troy! ), I mentally sorted through what I had learned from this journey. The 238-mile range that is marketed for the Bolt holds true during most of the year – I have proven that through my travels. But when you hit a true North Dakota/Minnesota winter, that range is more realistically 120-160 miles. Plan accordingly. The reduced range is no problem if you are using the car for daily commuting and charging at home. In fact, the fast cabin heat is a major plus. For long-range winter travel to be viable in North Dakota, there have to be more DC fast chargers along major travel corridors. Otherwise, a four-hour drive quickly turns into an overnight-stop-necessary headache. I was lucky and found all of my EV chargers open for use and in working order when I arrived. 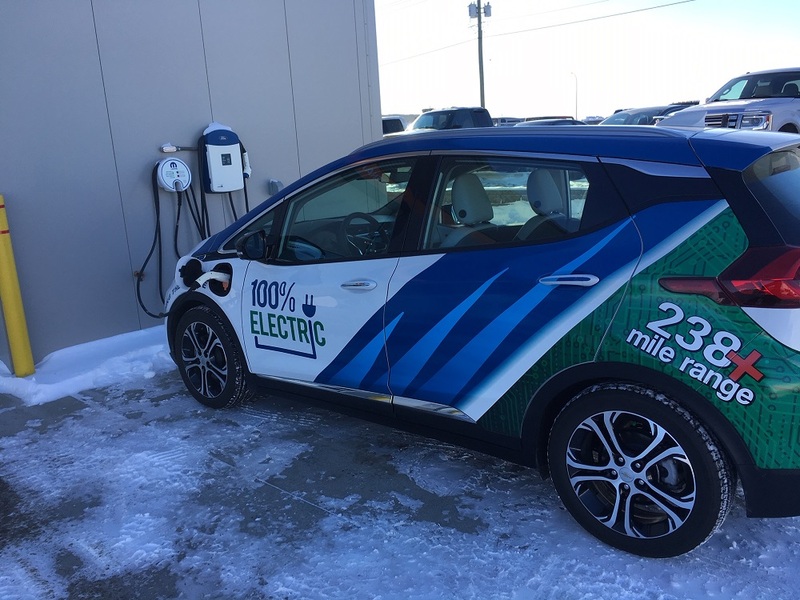 Because there are currently so few charging options in communities like Jamestown and Bismarck, you could easily find yourself in a tough spot. Call ahead and always have a plan B. This was my most challenging Bolt experience yet, but the data I was able to gather was so valuable. In a couple of weeks, I will be making the return trip from Bismarck to Grand Forks equipped with what I’ve learned. Fingers crossed for warmer, calmer weather! 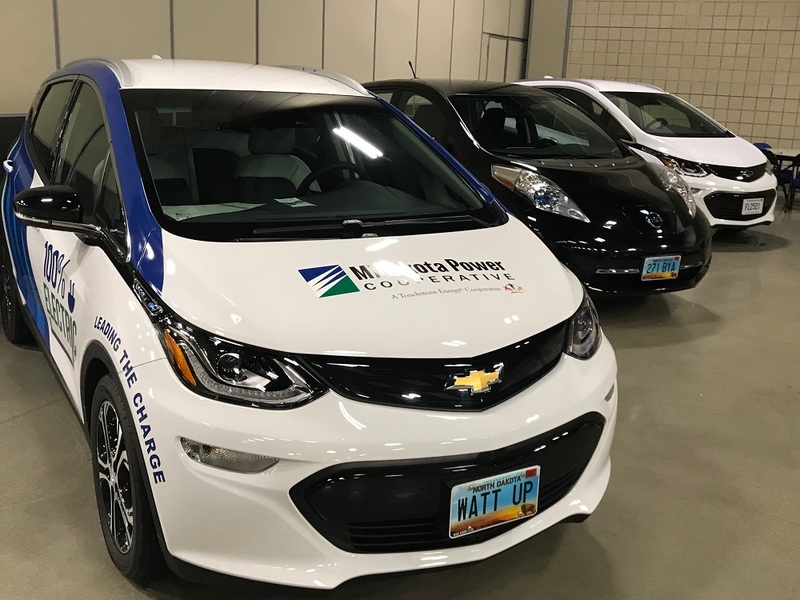 The Minnkota Bolt will be showcased alongside other North Dakota EVs at the Energy Generation Conference, held Jan. 29-31 at the Bismarck Events Center. The international event draws nearly 3,000 participants, so Bolty will have a lot of visitors this week!